You can play Helios at the Impact Project website! 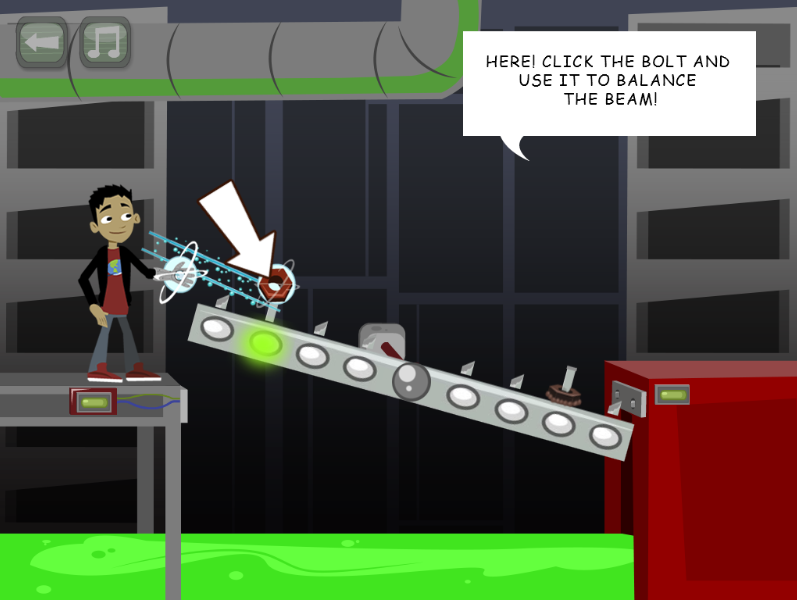 This game is designed to teach children (ages 6-9) how to solve balancing puzzles, ranging from circuits and bridges to goo and putting out fires. The design is based heavily on a research paper done by Carnegie Mellon University professor Robert Siegler on balance experiments. The goal of this game was to introduce balancing mechanics beyond that of the standard "teeter-totter" playground equipment. Helios utilizes 4 slots on each side of the beam instead of one, and children get to discover that balancing isn't as simple as they might have thought - and that it can be fun! 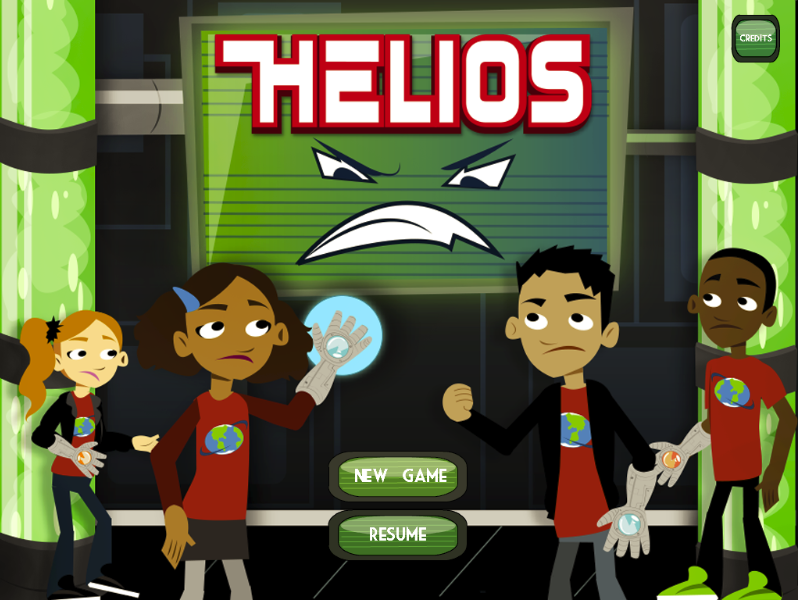 Helios is the fourth in a multi-mini-game project. The first games: RumbleBlocks, Beanstalk and Teeter-Totter Go!, kicked-off the project and helped us learn what was and what wasn't helpful in building educational kids games. Some examples would be how kids handle a mouse and keyboard, their familiarity with a computer and handheld devices, and the importance of a narrative. 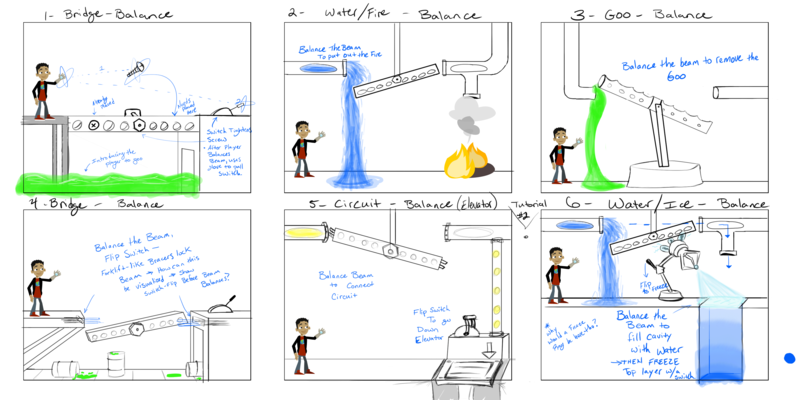 Our main goal for Helios is to actually meet Sesame Workshop's standard of quality and to re-skin the game to fit their Electric Company IP (all assets were specifically designed to be able to be re-skinned with minimal effort). 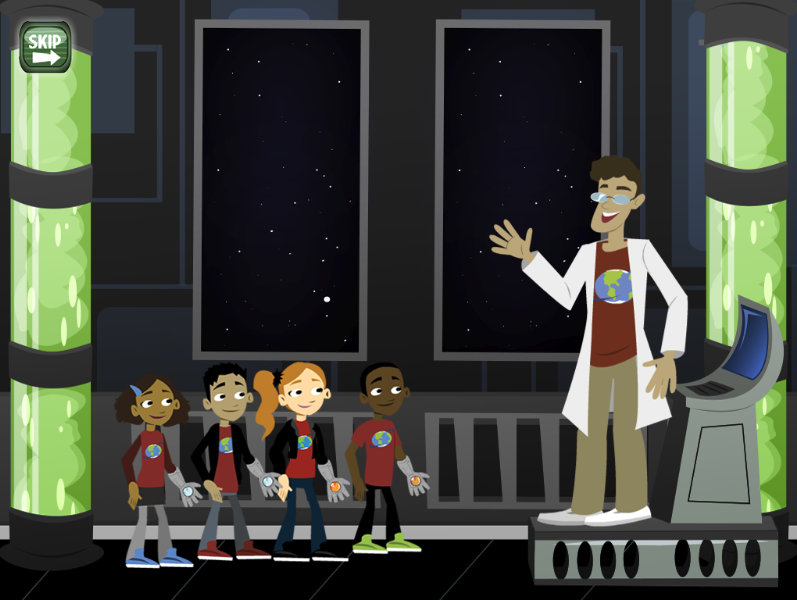 Once we we meet the quality of work that Sesame Workshop desires, we aimed to get a re-skinned game onto PBSkids.org. That effort was channeled into PuppyBot Rescue, after determining some gameplay mechanics and other design considerations needed to be changed. The hardest challenges are the ones that don't have clear answers. With these games, one of our objectives is to implement SEL (Socio-Emotional Learning); in otherwords, the processes through which children and adults acquire and effectively apply the knowledge, attitudes and skills necessary to understand and manage emotions, set and achieve positive goals, feel and show empathy for others, establish and maintain positive relationships, and make responsible decisions. The ideal method is to have 2 or more kids playing the same game (whether taking turns, co-operative multiplay, or some form of versus) and have them learn and understand and begin to apply SEL skills in the real world. An simplified example of this is you're picking apples, but the bag is too heavy to carry by yourself. Do you ask for help (A), or (B) empty some of the bag and carry it yourself. Throughout the games we've made, they've all been an interaction with an AI player, which works to some extent; but an AI has a pre-determined outcome and reactions, whereas kids are completely unpredictable. We've designed and touched base on a few multiplay ideas for SEL, but we think that the best method to tackle this unanswered objective is to build a few game prototypes specifically for SEL gameplay, instead of making it a side addition. We say this because the amount of time in a given semester is too short to implement a complex system for network gameplay amid other design and programming obstacles. There's also a number of other obstacles that would have to be designed and researched, because due to our age group, voice-chat, reading and game lobbies are something we would like to avoid. HTML5 Games are pretty much in their infancy. Especially since HTML5 became widely available in the past few years. Some game companies have done research and consideration into HTML5 games, but the general consensus is that HTML5 and web browsers are not fully ready for widespread development for HTML5 games. This combination makes for a perfect graduate school experience experimenting and developing HTML5 prototypes that while they work, gives the opportunity for students to improve and note development limitations and bugs. Most of our designs stuck for this game, mainly due to past experiences, we knew more of what would work and what would not. However, not everything stuck. 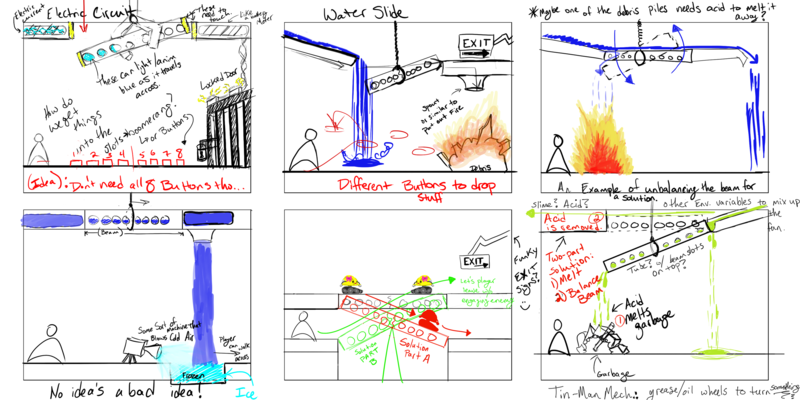 Our first pass at levels included connecting circuits (1), putting out fires (2, 3), freezing a gap of water and (4), building bridges and removing enemies from the players path (5), and using acid to remove a pile of debris (6). 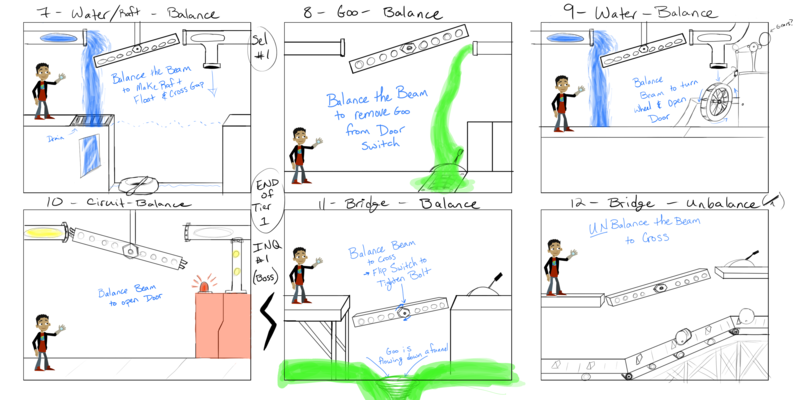 The last three designs were replaced with goo and elevator levels, and one level where the player crosses a pool of water with a raft. Level 6 - where you have to drop some water then freeze, and level 9 where the water needed to hit a water wheel and lift a gate were removed from the final game. We didn't want to create any misconceptions with ice (it's also not a very safe bet to walk on) and the water wheel would have been too complicated of an animation for a HTML5 / ImpactJS.